The other night I had company over (not a normal occurrence) and I looked in my fridge and let out a sigh. Ugh there is nothing to eat. At this point it was to late for grocery trips. So, I had to make do. I ended up making chicken stuffed with a tomato/basil goat cheese spread baked in stewed tomatoes with sautéed onions and fresh basil. Uhh… yum. Oh yeah, with yukon gold potatoes and a simple side salad. 1. 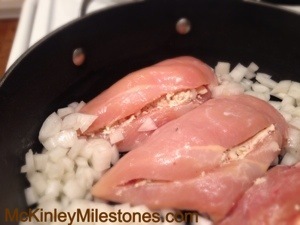 Take chicken pieces and create pockets or slices in them. 3. Let Olive oil heat in a pan, then add the Chopped onion and sauté for 3 mins. 4. 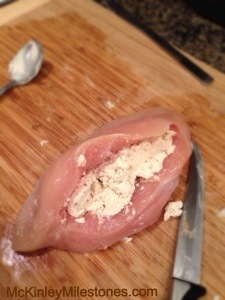 Add stuffed chicken breasts and sear them on both sides. 5. grease bottom of a baking dish that is at least 2qt thick. 7. Add onions on top. 8. Sprinkle cheeses on top and fresh basil. 9. 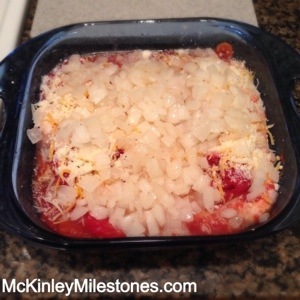 Place in the oven at 400 for 45mins. 10. 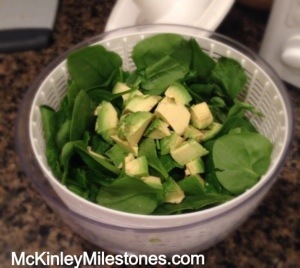 Enjoy with a simple side salad (spinach and cut up avocado). I forgot to get an end picture! Arg! Anyways it was a simple delicious meal with random items. Make do!! (Still no decorations up and the first snow fall is making me feel even more behind. Seriously Target, stop with the holiday music it’s the 12th). Thank you!!! I’m glad you enjoyed it!! Brought me a big smile.